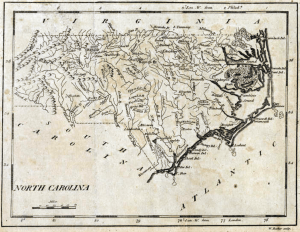 The Pocket Atlas Maps of North Carolina published by Mathew Carey, 1796-1820. Mathew Carey published his first “Carey’s American Pocket Atlas” in 1796. 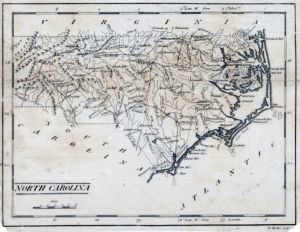 The engraved plate for this map of North Carolina was used in later issues of Carey’s pocket atlas in 1801, 1802, 1805, 1806, and 1810. Updates to the plate appeared with the 1801 and 1805 editions of Carey’s pocket atlas. A new plate was engraved for Carey’s 1813 pocket atlas. This map, without updates, appeared in at least six publications between 1813 and 1820. 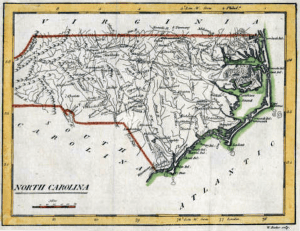 The map images are from the State Archives in Raleigh (1796, 1801, 1813-20) and the North Carolina Collection at UNC-Chapel Hill (1805). Clicking on any image takes you to the web page for that map on UNC’s NC Maps web site. Map dimensions recorded below are rounded to nearest half centimeter. State 1 – No lines above or below the map title. State 2 – No lines above the map title. Double lines below the title. State 3 – Double lines above and below the map title. None show county boundaries and only a few county names appear with town symbols. All states show named rivers and towns. Additional distinguishing features are provided below. 1796, in Carey’s American Pocket Atlas (Phillips 1364; Wheat & Brun 584). Many roads added as well as the following towns: Smithville (now Southport), Richland, Trenton, Swansboro, Waynesboro, Jones T., Murfree, Rockingham, Woodsboro, Stokes, Afordton, Lexington, Statesville. Additional roads (e.g. a road from Rockford to Wilks to Ash) and additional place names, the latter including: Sarecko, Core Bank, N. Lebanon, Princeton, Murfreesby, Leesburg, Pitts T., Averys T., Randolph, Carbarras, Lincolnton, Germantown, The Hollow, Rockford, Huntville, Wilks, Ash, Rutherford, Tennessee. Erased place names: Murfree (the new Murfreesby is slightly north), Meherrin. The engraver responsible for the updates on State 3 is not known. The original engraver of the plate, William Barker, died “of a decay” in 1803 (referenced here). Barker’s imprint persists at the bottom right. 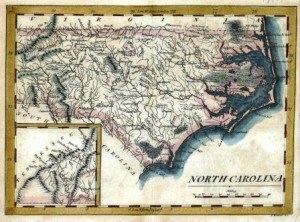 Although slightly smaller than the 1796-1810 map, it is most easily distinguished from the earlier plate by the presence of an inset of western North Carolina in the lower left, and the title now at the lower right. No changes observed in the plate from its use in 1813 to its use in 1820. The engraver was John Bower. -Published by Benjamin Warner and M. Carey & Son. Additions and or corrections to the above data would be greatly appreciated. Please use the “What’s on your mind?” comment box below. Many thanks to everyone involved in creating and maintaining the North Carolina Maps web site and for making so many wonderful maps of North Carolina available for study on line. Thanks also to Dave Morgan of the C.A.R.T.E. Museum for the invaluable information he provided. This entry was posted in 18th Century, 19th Century, Cartobibliography and tagged john bower, mathew carey, north carolina maps, William Barker by crmaps. Bookmark the permalink.